On October 5, 2009, AMBA became a partner in the Army Spouse Employment Partnership (ASEP), now the Department of Defense Military Spouse Employment Partnership (MSEP), as a way to strengthen its commitment to support of military families. AMBA values the role, talent, and ability of the military spouse in improving the quality of life for military families. As an MSEP partner, AMBA works to promote career opportunities through it’s member banks. The Statement of Support signing Ceremony between the Honorable Thomas R. Lamont, Assistant Secretary of the Army, Manpower and Reserve Affairs, and Major General Andrew Egeland, Jr., USAF (Ret. 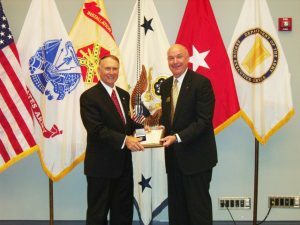 ), President/CEO of the Association of Military Banks of America, took place at the Washington D.C. Convention Center. Subsequent to its establishment in 2009, the successful Army Spouse Employment Partnership, has transitioned into the DoD Military Spouse Employment Partnership (MSEP). Many AMBA member banks are also MSEP partners and provide employment opportunities to military spouses in the banking industry. AMBA and several AMBA member banks participated in the 2013 Annual MSEP Induction Ceremony and Partners Meeting on November 5, 2013.